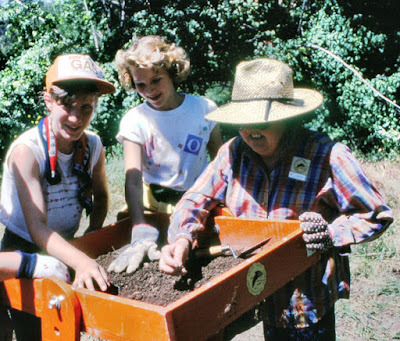 Pat Hearle teaching kids about archaeology at Santiago Oaks Regional Park, 1986. I'm sad to report the passing of Pat Hearle. She was a regular at the County Archives and an active member of the Orange County Historical Society, the Orange County Pioneer Council, the Pacific Coast Archaeological Society, and the Old Courthouse Museum Society for many years. Hardly a week went by when I didn't have a conversation with Pat. She is already missed. Pat was a member of Orange County's pioneer Greenleaf family. Her ancestor, Dr. Edward F. Greenleaf was from the same little town in Clark County, Missouri as William H. "Uncle Billy" Spurgeon. After Spurgeon founded the town of Santa Ana, he wrote to Greenleaf, inviting him to come and serve as the town's first doctor. Pat said she once visited that small Missouri town and said she could see exactly why both Spurgeon and Greenleaf both wanted to escape. When she was a girl, Pat's family owned a large parcel of land on Greenleaf Street in Santa Ana. Somewhere on that land was "the largest pepper tree in Southern California." How large was it, you ask? It was large enough that it appeared on aeronautical charts and aviators used it as a navigation landmark. Sometimes pilots, while trying to get their bearings, would circle the tree again and again. Pat remembered climbing this giant tree and watching the planes circle. Pat was on the faculty of Walt Disney Elementary School in Anaheim when it opened in 1957. Walt Disney himself was on hand for the opening. He'd had his artists paint a mural of Disney characters all around the school's multi-purpose room. He also gave free one-day Disneyland passes to all the students and teachers and their families. School was dismissed early. Pat went home, collected her sons, and spent the day with them at Disneyland -- on Walt's nickel. Pat enjoyed the annual Orange County Pioneer Picnics, and recounted how people at each table would brag about how early their families arrived in O.C. "My family arrived in 1918," one would say. "Well," huffed another, "my family came here in 1902." If asked, Pat would say her family arrived in Santa Ana in 1882, which usually ended that particular line of conversation. She got a kick out of the awkward silence thereafter. Pat had many lifelong friendships, she loved her archaeological trips to China Ranch in the Mojave, and at the end of her life she worked hard to remain as independent as she could for as long as she could. She was a strong woman with many interests and it was hard not to like her. Leonore Patricia "Pat" Hearle, late of Anaheim, died May 23, 2015 of natural causes at age 83. Born December 21, 1931 in Santa Ana, she was the only child of Leo Patrick Flaherty and Hazel Greenleaf Flaherty. A lifelong resident of Orange County, Pat grew up on Greenleaf Street in Santa Ana, and graduated from Santa Ana High School and Santa Ana College where she sang and performed leading roles in numerous productions. She earned her B.A. and teaching credential at Cal State Long Beach, and, after her 1954 marriage to Herbert David Hearle, she taught briefly at the newly opened Walt Disney School in Anaheim. After the birth of her third son, she went back to teaching at Cambridge Elementary School in Orange where she taught kindergarten and first grade for thirty years. In 1960, she was Vice President of the Long Beach State Alumni Association, and at different times was a longtime member of the Orange County Sports Car Club, Junior Ebell of Santa Ana, and the Pioneer Council of Orange County. After her 1977 divorce, she served four terms as President of the Pacific Coast Archaeological Society. She was always active on the planning committee for Santa Ana High School Class of 1949 reunions, and also served as a member of the Old Courthouse Museum Advisory Committee for many years. Her longest and favorite residence in adulthood was in Bluebird Canyon in her beloved Laguna Beach. She is survived by her sons, Patrick (his wife Sally), Kevin (his wife Libby), and Michael; two granddaughters, Ashley and Amanda; and one great-granddaughter, Austin. A Celebration of Life will be held June 20, 2015 [at 12:30 p.m.] at the Clubhouse of Harbour View Park at 16600 Saybrook Lane in Huntington Beach. In accordance with her wishes, she will be buried in the last of the Greenleaf family plots in Santa Ana Cemetery. I remember attending the pioneer picnics as a young child in the '50's. People used to wear tags with the year they came to Orange County. It was great fun to run around trying to spot all the folks from the 1800's. 20th century arrivals we a dime a dozen. I went to Cambridge Elementary for 1st, 2nd and part of 3rd grade until California opened. I was probably there a few years before Mrs. Hearle came.